All year long, Disney, Lucasfilm and their licensing partners have been celebrating the 40th anniversary of Star Wars: A New Hope. Originally released on May 25, 1977, A New Hope ushered in not just a new era for films and fandom, but basically jumpstarted the toy industry as we know it today. Without the success of Star Wars as both a movie franchise and a toy line, the 1980s would have been a very different scene for toy collectors, manufacturers, and fans alike. Fortunately, the 3.75” action figures released in 1978 — known in the Star Wars world as the original 12 — ended up setting a new standard for toys, and our shelves were forever changed. With that in mind, we hit up Steve Evans, director of design and development for Hasbro's Star Wars series, to talk about Hasbro's 40th Anniversary figures, the return of the Vintage Collection, and what lies ahead for the Star Wars Black Series. Hasbro honored longtime fans of their action figures with its 40th Anniversary collection. The classic original 12 from 1977 getting a modernized approach, including a remastered display stand, was a great nod to longtime fans. With the whole collection now hitting shelves, how has the response been to this trip down memory lane? Star Wars: A New Hope became not only the beginning of the famed Star Wars franchise, but also the start of Hasbro’s epic toy lines based on the Star Wars films (thanks to the equally epic efforts of Kenner). Since the first film burst onto the scene, the toys and action figures from the Star Wars universe continue to be an integral part of the franchise’s history. Hasbro values the Star Wars fan community, and has a history of providing products that bring consumers their favorite characters and scenes to life in powerful and imaginative ways. With the new 40th Anniversary line, fans can now celebrate A New Hope and this iconic moment in time with new Hasbro action figures and vintage packaging from the original Star Wars film, and feel the nostalgia as they start hitting shelves. Fans of all generations have shown an overwhelming amount of enthusiasm for these figures, and it’s because of those fans that the Star Wars toy line is still a huge element of the franchise 40 years later. The big news out of Celebration earlier this year was the impending return of the Vintage Collection. What made now the right time to revisit this line, and how will the Vintage line differentiate itself from the 3.75” Black Series? Hasbro is committed to reaching a broad audience of fans and providing play experiences that will inspire each unique consumer to recreate their own authentic Star Wars adventure — the recently announced Forces of Destiny is another example of this. We sincerely value fan feedback and attempt to embrace their recommendations as much as possible. That being said, we are beyond excited to re-introduce the Vintage Collection 3.75” figure assortment. This collection is separate from the current Star Wars Black Series 3.75” line available at Walmart, and at this point, there are no changes being made to the Walmart offering. With the Vintage Collection making a big comeback next year, is it possible that 3.75” vehicles are on the horizon as well, or will the Vintage Collection focus mainly on characters? We’re not able to comment on specific upcoming and unannounced products. Suffice to say, there’s a lot more to come for the rest of the year and into 2018. We think fans will be happy with what we’re cooking up. In addition to Rey kicking off the new iteration of the Vintage Collection, Hasbro also held a fan vote which was won by one of the newest characters in Star Wars canon, Doctor Aphra. Hasbro’s had long history of including characters from all over the Star Wars media empire in the figure lines, but Aphra beat out some pretty stiff competition. What is it about her that you think will make her a great figure? Doctor Aphra has swiftly become a fan favorite; She’s a tough female lead with a fun-loving, infectious attitude. Plus, she gets to hang out with Darth Vader! That gives her major cred. Fans embrace her because her personality and actions are so true to the Star Wars universe. It’s very exciting to know she’ll be getting her own figure in the Vintage Collection; Her strong following of fans will be thrilled! We know The Last Jedi announcements are being kept for later this year, but there were still a number of new figures unveiled for the first time at Celebration. For my money, Legends character and previous fan vote winner Jaina Solo was the most impressive, especially considering how she was made. How long did it take to find the right balance of Harrison Ford and Carrie Fisher to arrive at the “perfect” Jaina, and can you offer any insight into that process? 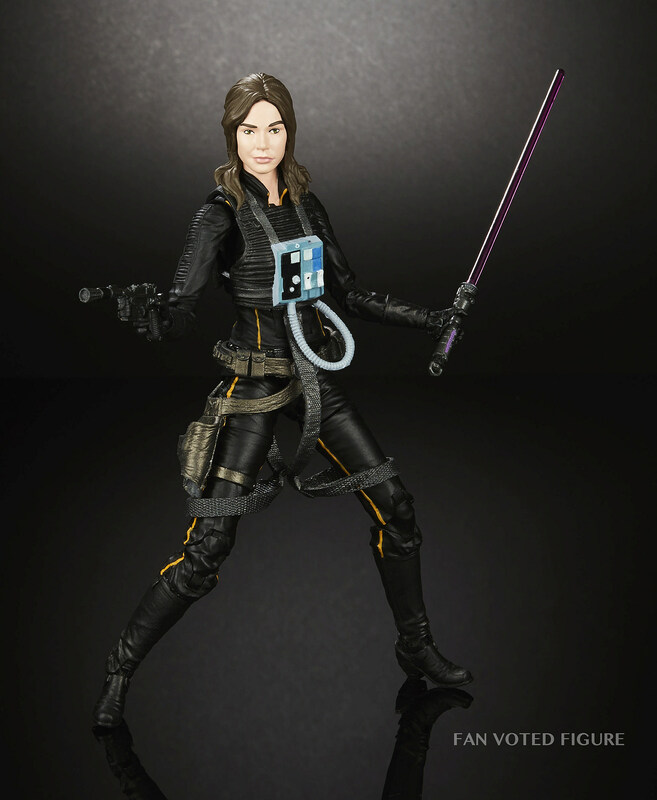 The Design Team for the Jaina Solo figure did an incredible job melding together small features found in iconic favorites Han Solo and Princess Leia. In order to create an accurate and realistic design and sculpt, the team took digital representations of Harrison Ford and Carrie Fisher and blended them together until they found the perfect combination. Because of this method, you can look at the Jaina Solo figure and immediately understand who she is based on the different features she encompasses.